The fourth instalment in the Veil Knights series brings Jazmine Archer to centre stage as she joins Dante Grimm’s quest to find talismans that combine to renew a mystical barrier, which will keep supernatural races from pillaging our world. Ex-street racer turned casino owner after the untimely death of her sister, Jaz Archer can see and control luck. 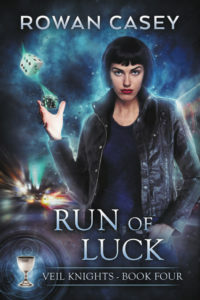 Able to give, take away and redirect luck as she sees fit, she protects her casino’s profits by preventing patrons from getting too lucky, until a combination of lack of sleep and a distraction result in the death of a customer whose luck literally runs out. When a mysterious stranger brings the customer back to life and promises to do the same for her sister if she will find the talisman that Grimm wants, but deliver it to her, Jaz finds herself drawn back into the deadly world of street racing. The illegal world of street racing is superbly brought to life on the (electronic) page, the thrill of motorbikes weaving in and out of traffic in the race of their lives sets the heart racing as Jaz learns to race without using her abilities. The reader is fully immersed in the mythology that the team that comprise Rowan Casey have created. Celtic mythology combined with street racing delivers another electrifying and enthralling adventure. Bring on book five – please don’t make me wait another month for it!